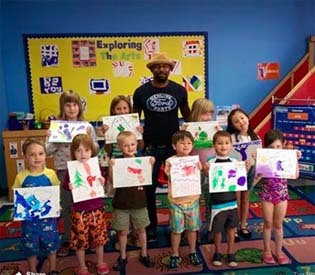 Haitian-born, Connecticut-raised and Yale-educated modern artist Guy Stanley Philoche immigrated to Connecticut when he was three. As the middle child of three boys and coming from a family of sports enthusiasts whose passion he didn’t share, Philoche turned to art as his calling. 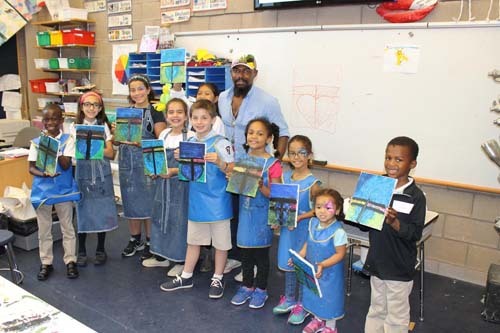 While remaining close to his Haitian Roots, Philoche was the only son to buck his culture’s tradition of the entire family living together and struck out on his own – first attending Paier College of Art and then Yale. He now lives in New York City. 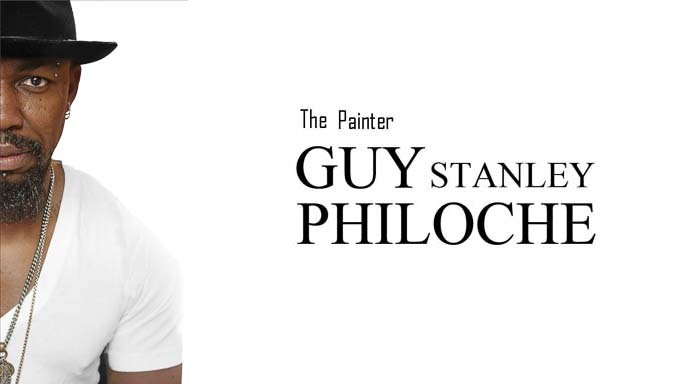 For the past 15 years, Guy Stanley Philoche has been attracting international attention with his work and his impressive roster of solo shows. As an artist, Guy’s palette is strong and sophisticated. His layering technique has created a body of paintings so richly textured that one can hardly hold back from reaching out and touching the canvas. In fact, it is the artist’s intent and wish that the viewer will follow their desire to reach out and feel the different textures of his canvases. His work is for the viewer’s pleasure, to be fully enjoyed from a tactile standpoint, and he has varnished the canvases for exactly that reason. 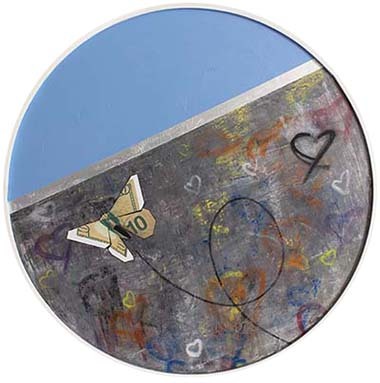 In “Come Fly With Me,” Philoche’s newest series, the artist’s lush surfaces were inspired by the buildup of city walls, thick with traces of wheatpasted posters, advertisements, tagging and graffiti. Paper airplanes made from collaged reproductions of dollars and euros come zipping through the frames, leaving their swirling trails behind them in great looping gestures. From the glib use of $100 bills for some of the airplanes, to smaller denominations folded into the form of butterflies that momentarily alight on round canvases, Philoche’s folded bills draw attention to currency’s status as an abstract sign, with no inherent material value once detached from its system of circulation. 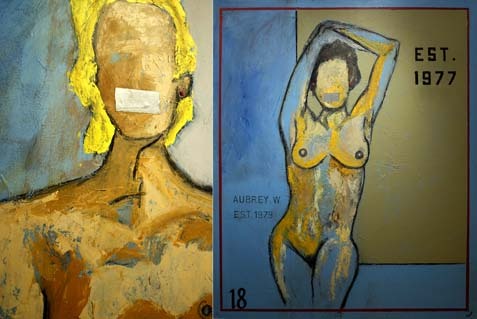 In his debut work - the acclaimed “Untitled Series” Guy established himself as a force to watch on the art scene. In this series of 100+ paintings blocks of color are contained within thick black lines, giving a geometric grid to his work. At the same time, complementary colors, mixed to create a richness rarely seen today, add an elegant beauty. The viewer could get lost in the paintings for hours. Philoche explains his choices, “each painting depends on my mood on a particular day, if it’s sunny and I’m feeling happy I may use pink but if I am having a particularly bad day my palette will have red or black, it all depends on my emotions.” Guy describes his “Untitled Series” as “Rothko only sexier”. 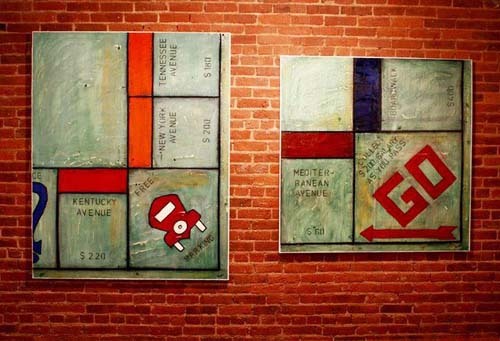 In the “Game Series” the canvases are made to look worn, well used, right down to teeth marks. To achieve this look Guy uses a distressed color palette and textures the canvases with dents, cracks and tears. The goal is to evoke nostalgia, warm memories of shared times with Guy’s friends and family. Philoche’s fresh and provocative “No Comment Series” that recently debuted at Castle Fitzjohns Gallery located in the Lower East Side of Manhattan demonstrates the many artistic styles he is capable of expressing. The inspiration behind this series is Philoche’s commitment to human rights issues. While women here in the U.S. are far better off than in most countries, prejudice against women remains a significant problem. Women still don’t receive equal pay for equal work; they are underrepresented in government, battered, raped, and trafficked. Philoche wants to support and help raise awareness of the critical issues that affect women without a voice. Philoche believes it is a moral imperative to "give-back" and has generously donated his time and work to benefit a great many charities over the years including The American Cancer Society’s Pink and Black Tie Gala, Kids With Cameras, My Language Project The Leukemia Needs Foundation, ARTrageous! and Tibet House. He is also one of a handful of artists who have committed to buying a painting whenever he sells a painting in order to support fellow artists. Guy is truly a gift to the modern art world.